Ok, so here’s the deal. The small town I live in has no respectable dinning establishments and I can’t afford to drive into KC every time I need a taste of civilized food. This forces me to get creative in the kitchen! Years ago while living in Wisconsin, my local library was selling old books…really cheap. I found this nicely bound copy of Antoine Gilly’s 1971 issue of “Feast of France”. This was back in the mid-1990s and I’ve never used the book until moving here to the hinterlands of west-central Missouri. Over the last couple of years I’ve experimented with Gilly’s recipes, modifying them to my taste and to what foods are available locally. After posting some comments about the success of this dish on Facebook, my friend Bob (my former Army squad leader down in Panama) inquired about the recipe. So Bob, and any one else who might enjoy something different, here’s what I cooked up this afternoon. Enjoy! In a non-stick skillet, pour about a tablespoon of olive oil over a medium/high heat. Lightly dredge beef cubes in flour, salt and pepper and sauté in skillet until browned on all sides. When finished, place browned beef in crock-pot. Add remaining ingredients. Withhold heavy whipping cream until end. Cook all ingredients in crock-pot on high for 4-5 hours. Beef should be tender. Transfer contents of crock-pot to large pot on stove and bring to a good boil. Meanwhile, combine about ¾ cup of warm water with 2-3 tablespoons of flour, whip until smooth. Gradually add to boiling stew to thicken. Reduce heat to simmer. Add 2-3 tablespoons of heavy whipping cream. Skim any fat off top. Serve with warm, hearty rustic bread of choice. Bon appétit! This past weekend marked our second annual “unofficial” spring break photo trip to the prairies of Flint Hills region in Kansas. By far, one of my all-time favorite places in the U.S., I never get tired of photographing there. Every time I return to these prairies, the scene is never the same and depending on the time of year, it might be shades of earthy browns or lush emerald greens or charred black from fire and dotted with copious amounts of flint and limestone. 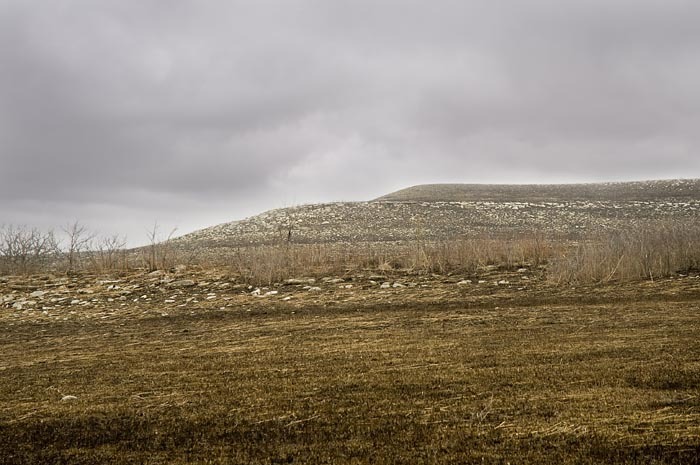 Originally, myself and two other photo professors (Tom and Wilson) from the University of Central Missouri started going to the Flint Hills for its unique photographic qualities…and we soon fell in love with this region. Eventually we invited other faculty and alumni. Last year I convinced my colleagues to encourage photo students to tag along…unofficially. We had a good time, so this year I promoted our event more aggressively. 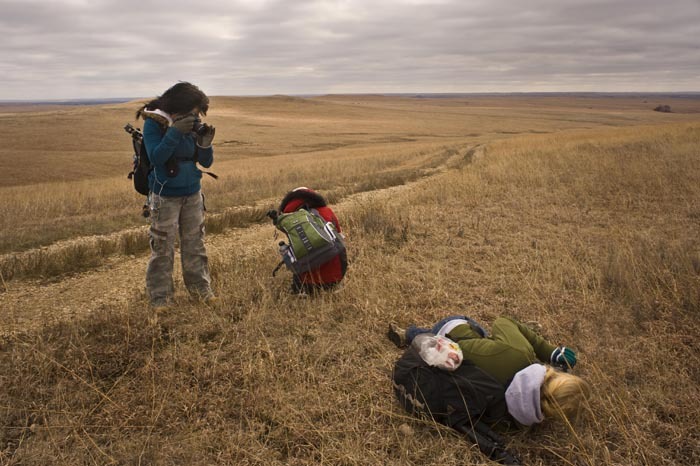 All total, there were 17 like-minded folks trekking the plains, including three international non-photo students (one from France and two from South Korea). My travel partner (Robert) on this trip was my former portfolio student and an extraordinary nature photographer in his own right, having backpacked more than 30 years and traveled in 17 countries. Check out Robert’s work by clicking here. We gathered early Saturday morning just off campus and car pooled west to the Kansas Turnpike, stopping at the McDonald’s oasis just east of Lawrence. This stop off point has become a breakfast ritual over the years and a brief chance for our first socialization outside the university. Next, we caravanned southwest to Emporia and descended on a lone Subway sandwich shop in order to take lunch with us on our first seven mile hike. 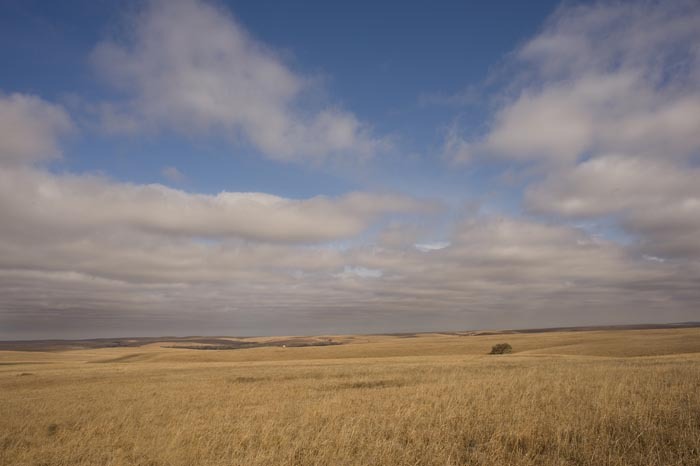 After arriving at the Tall Grass Prairie National Preserve and getting our orientation briefing from the ranger, off we headed on the Scenic Overlook Trail, taking us well into the backcountry. The park service estimates this to be a 2.5-hour round-trip hike…they didn’t anticipate a bunch of photographers! We spent closer to five hours hiking, photographing, eating lunch in sheltered limestone creek beds, and having encounters with bison. Only one in our party took the wrong trail on the return and ended up three miles south of the historic ranch headquarters, but we eventually found the wayward student and immediately set off on the second leg of our journey…Junction City, home of the Big Red One and the atomic cannon. Day two of our trek began early with a short drive east to the Konza Prairie Biological Station, just south of K-State. Here we were greeted by numerous deer and at least 50 wild turkeys. What a sight! The morning was not as windy as the previous day, but it was damp and misty. Had to break out the rain pants. Large portions of the Konza had been burned and thus revealed many limestone outcroppings and ribbons of chert (flint). I’ve never seen the prairie look like this before, so I found it quite interesting. As I said at the beginning of this blog, the prairie is always changing and never stays the same…always providing new photographic opportunities. Several of us rendezvoused at noon and headed into Aggieville for a bite at one of our favorite eateries, the Bluestem Bistro. I’ve eaten there several times now, and never been disappointed in their coffee or fare. This time lunch was a turkey and sundried tomato quiche with their skillet hash browns. Fantastic! 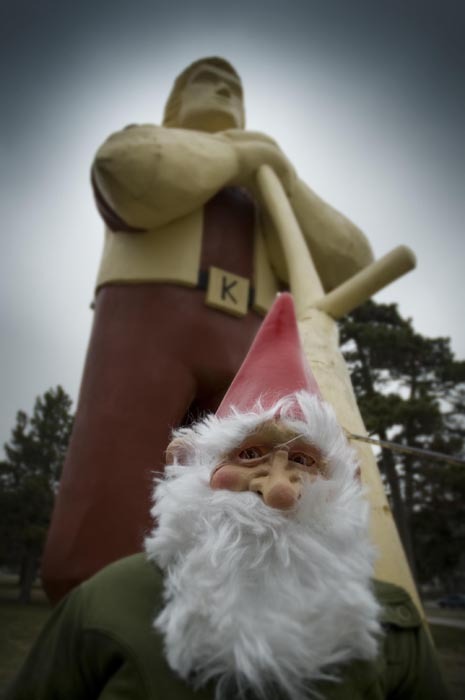 On the way out of Aggieville, we spotted an elusive Wisconsin gnome in the park, checking out the mythical 30-foot tall Johnny Kaw statue in the city park. Perfect ending to a great photo safari on the Kansas prairie!